Welcome to the greatest sale all year! Everyone and their mother is posting their top picks so I'm honored you landed here! First, you need a Nordstrom credit card to access the sales today through July 19th. If you don't have a Nordstrom credit card have no fear because the sales will open to everyone on July 20th!! Below are my favorites and everything that is in my shopping cart. If something is sold out, don't fret!! It will more than likely come back in stock but not guaranteed so better to get it now and return it later! Feel free to ask any questions in the comment section or on my IG. I'll try to get back to you asap!! I thought I would share our pictures + all the info for our outfits! I stayed up all night before we left (in my defense our alarm was to go off at 3:00 am) because I was super excited and just going over all my to-do's before our airport ride picked us up. Anyone else struggle with ongoing lists in their head?! We got to the airport before Starbucks even opened and I felt like we had already conquered a full day. We may have ordered room service every time we got to our room, and we may have tried every cool/weird drink we could. Perks of all inclusive.. right? St. Lucia was gorgeous and we had the best time with family & friends! Can't replace it? Fix it! Let's be honest, we all have some things in our life that we don't like. Maybe we tend to be more critical than encouraging. Or maybe we interpret things other people say with way more emotion than necessary. Or maybe in an effort to create peace in our relationships we get controlling. I have those things about myself. I want to change but I know if I don't intentionally work on my issues, I won't. Time will pass. Frustration will increase. Discouragement will set in. And eventually I'll buy the lie that I can't change. But recently I realized something because of a silly thing I don't like. The front door to my house. I felt like I needed an excuse for it every. single. time. someone came to our house. In my defense, I tried replacing it with something else but it wasn't a fit. We bought a beautiful historic, Charleston front door but after three contractors said it wouldn't work, I gave up. Then this past weekend I decided to stop pulling into the driveway hating on that door and just do something about it. If you can't replace it, fix it! Honestly, changing my front door wasn't crucial. But it did remind me that making changes in me to improve my relationships around me, is really important. And now is the time to ask God to show me how to start making positive changes today. With His power working in me, I can choose to start being more encouraging... more positive... more forgiving... more like Christ. 1) sand the top layer with a sanding sheets. We used this one. 2) take a wet washcloth and wipe it all down and wait for it to completely dry. 3) tape around door handle as much as you can. Spray paint and let dry. 4) paint the detail on the door first. Paint brush we used. 5) take tape off around door handle and paint the rest of the door. Once the first coat on the door is dried, paint a second and possibly a third coat if needed! First, this is super late. I know. BUT at least I'm posting about it. If you haven't already stocked up and ordered all your wants, needs, desires.. I'll be shocked. If you have no idea what the Nordstrom Anniversary sale is.. well .. welcome! First, you need a Nordstrom credit card to access the sales today through July 20th. If you don't have a Nordstrom credit card have no fear because the sales will open to everyone on July 21st!! Below are my favorites and everything that is in my shopping cart .. Happy shopping!! I'm sure you're already aware of what my family is going through at this time. But if you have no idea what I'm talking about then read my mom's blog here. I wrote this on my Instagram last week.. This past year has been the biggest roller coaster of emotions & events, intense week long counseling sessions, the biggest thing in my life kept private, and one strong family. Because of the pain of having to be kept quiet, I've never struggled with friendships or loneliness more. There is a lot of uncertainty. I feel like my life the past year has been kind of like standing on sinking sand. I never knew when things would sink or stay put. It kept going on with things I know to be certain in this season. Something I didn't add in that post was how much worship music has carried me in the darkest of places. It has pretty much been my quiet time every day for the past year. When I didn't have the words to even make sense of what had happened, I turned on my worship music really loud and would just sit there listening. Every single time I listened to the music, it would lift my spirits and make me feel like I can take on the day. Whatever was thrown at me, I felt like I was going to be okay because I knew God was in control. After the news about my family was made public, I had an overwhelming amount of people reach out telling me they are going through the same thing. While it broke my heart, it also made me realize how many people are hurting right now and are so desperate for hope. I hope you are so encourgaed by listening. Let me know if you have any songs you would add to my list! If I could add more love languages, I would. If there could be more than five, I would add hospitality. And for me that would be hosting parties. Which probably already falls into another love language but I think it should be separate. I LOVE hosting. It is so woven into my DNA. I'm that crazy person who will throw a party for the heck of it even when there really isn't time in my schedule. I think I love hospitality so much because I grew up with parties being hosted at my parents house all the time. My moms loves it too. I personally think she threw some of the best parties I've ever attended. One small dilemma I run into when hosting parties.. They can be SO expensive! I have a feeling some of you party planners run into this as well?? It's like you want to throw the most beautiful and fun party but how do you do this when on a budget? SO here are THREE ways I have learned how to host on a budget..
ONE) Clip greenery from the side of the road / your backyard / neighbors yard ( ;) ). I really can't take credit for this one because I have learned how to perfect the off roading greenery clipping from my Nonnie. She has always done this and her greenery arrangements are so beautiful. Now, I do buy some flowers from the store but you don't need many! Just some to throw into a vase here and there. I've attached some pictures below so you can visualize this! TWO) There is no shame in hosting with food from various different places. I'm just freeing you of having to have a homemade meal prepared for everyone. Ask a few people to bring some side dishes. Get a chick-fil-a nugget tray. Grab a veggie tray from your local grocery store. Chop up some avocados, add in a can of salsa for yummy guacamole. Make an easy cheese platter. It doesn't have to all be made by you for it to be special. I will usually designate a few people to bring some items and then I will fill in the gaps. It's fun to have lots of options and yummy too! THREE) Save your decor! I have a box full of past party decor that I always pull out to reuse. For example, you have leftover party straws & napkins? Save them for the next party and throw them in with another pattern. I got gold balloons for the last party I threw and I'm going to save them and get creative on how I can use them again even though they have deflated. You never know what you might be able to use again. Also, keep checking the dollar store or dollar section at Target. They have hidden gems every now & again. So there you have it party planners! What tricks do you have up your sleeve when it comes to hosting on a budget? Comment below all your fun ideas! When we bought our house I knew the biggest transformation would be the kitchen. I was super excited about designing it and seeing it actually come to life! We ended up having to take everything down to the beams and subfloor because of water damage. But that's life when you're trying to tackle a fixer upper. The kitchen was for sure the longest lasting project! The laundry room took the place of a fridge. So the previous owners used a mini fridge. We quickly decided that wouldn't work so we ended up moving the laundry room upstairs where the linen closet was. 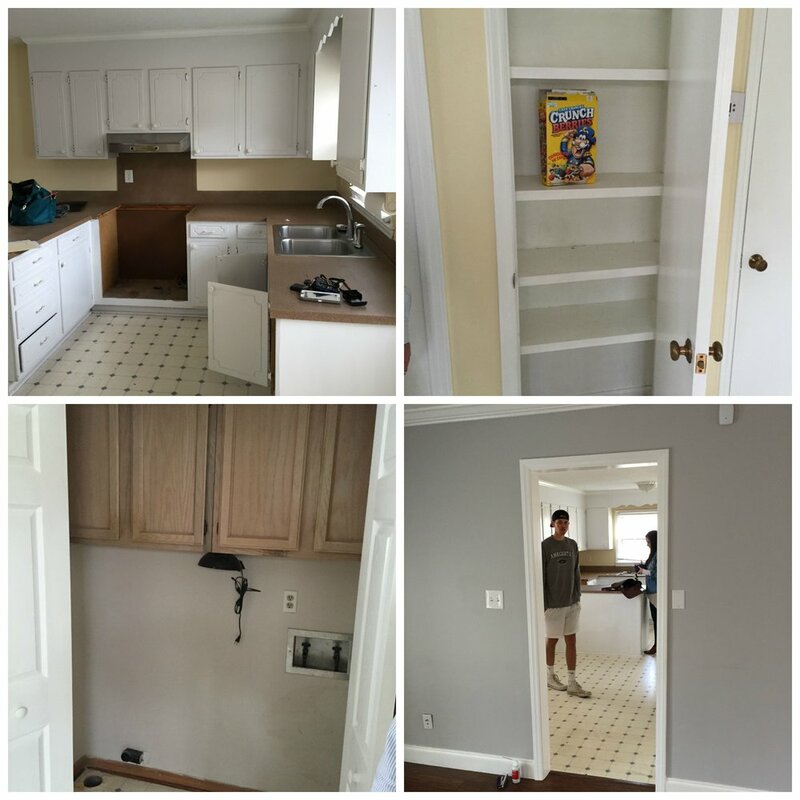 The bottom right picture was a wall separating the den from the kitchen. It made everything seem a lot smaller so we knocked down that wall. It really helped open up the downstairs and made it seem so much bigger. Crazy how one wall can make all the difference. We chose the beams & now I'm kind of thankful we ran into that problem! I LOVE the beams. It was a great problem to have. The picture with the wood shelves & the fridge is where the old laundry room was. We knocked down those walls and made the kitchen all one room. We also took the door off of the pantry to make it appear like open shelves for display purposes. The closet with the chalkboard paint on it is now where we store pantry items. We got shelving from ikea and it works great! I'm so excited to share with you one of my new favorite staple pieces. My JORD watch! I get so many compliments on it so I thought I would just share all about it here! JORD watches are made out of natural wood and that for sure helps the look of them. I love the rustic tone of my watch! Click here for the link to the one I have. The packaging is really what makes receiving a JORD watch a full experience. Inside the package came this BEAUTIFUL wooden box which held everything inside. In the pictures bellow you will see what JORD packages in each personalized box. -A cleaning kit to keep the wood looking fresh and in shape! -& bonus... you cause repurpose your wooden box as a jewelry holder! The rest of our wedding pictures I promised! Part 1 of pictures is here. Our flower girls were my niece & cousin! Each guest had a candle on their seat as they arrived to the ceremony. Find out why below..
My favorite part of the ceremony was actually my moms idea! My parents read a prayer that my grandparents prayed over them on their wedding day! While my parents read the prayer, our bridal party lit all of our guests candles. Think Christmas Eve candle service ;) It really was so special and I've never seen it done at a wedding before! Chick-fil-A mini's were passed around during cocktail hour (cause who doesn't love them??). On our desert table we had, macaroons, salted caramel brownies, cake pops, & of course cake!